In the year to September 2013 Australia added 542.1 million tonnes of carbon dioxide to the atmosphere (ref). That's nearly 1.5 million tonnes every day (1,485,017 tonnes). 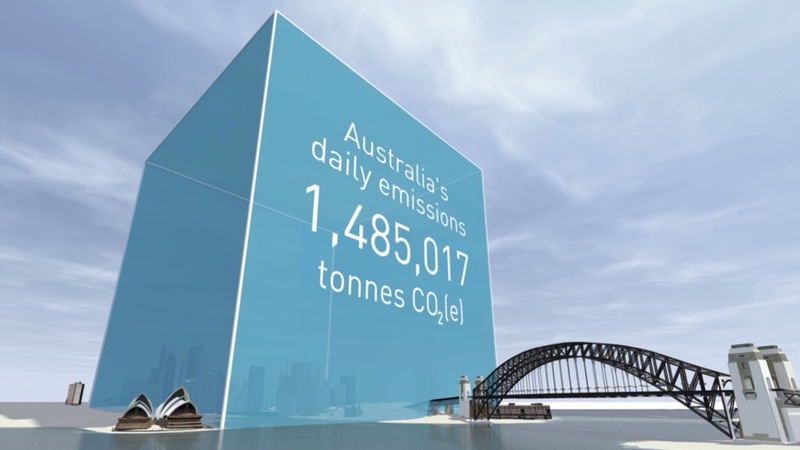 The daily emissions as carbon dioxide gas would fill a cube 926 metres high (3,038 feet). 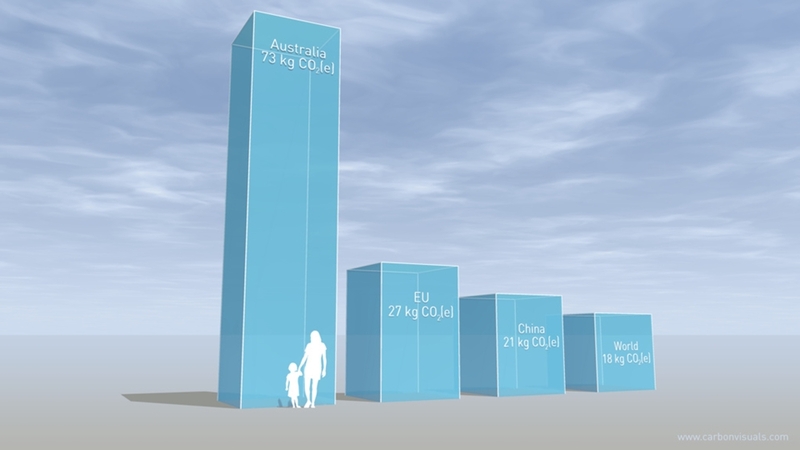 In 2010, Australia's daily per-capita emissions were equivalent to 73 kilograms of carbon dioxide. Data: CAIT2.0. That's over 4 times the world average and nearly 3 times the average in the European Union. I make no bones about it, we want to make imagery that helps everyone in the world better understand the carbon ‘stories’ and data that relates to them. Australians have a very high per capita carbon footprint – primarily due to a reliance on coal for electricity generation. The country is not only starting to see at first hand the effects of climate change, but also uniquely has the ability to quickly transition to 100% renewable energy according to the Zero Carbon Australia 2020 Stationary Energy Plan. Our prime minister can imagine daily emissions just by pulling the curtain aside at Kirribilli House. So when David contacted us we jumped at the opportunity to create some Australia-focused images. Australia's prime minister Tony Abbott famously dismissed carbon dioxide as an "invisible substance" (see YouTube video) so for his convenience, we have selected a view from his official residence in Sydney: Kirribilli House. If he could see it, maybe he would do something about it. But we hope this is just the start of a process of helping Australians better understand the carbon emissions not just associated with their own country, but also related to the burning of exported coal. 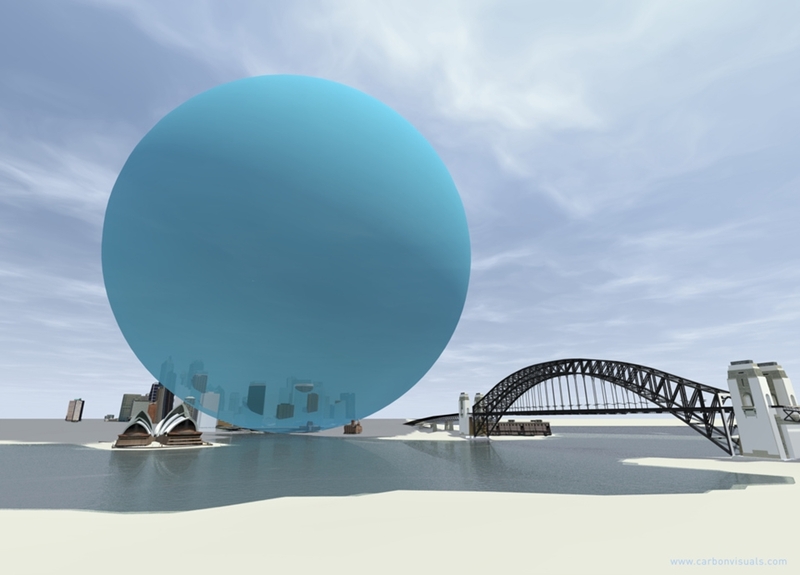 Do get in touch if you know organisations or individuals who would be interested in funding a much more comprehensive image and animation set that really tells the Australian ‘carbon story’.